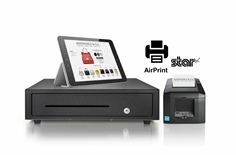 High Wycombe, UK, 14 November 2017 – International POS printer manufacturer Star Micronics announces today that it has officially received certification for the first Apple AirPrint™ POS printer, the new Star TSP654II AirPrint. This printer is the first 80 and 58mm receipt and ticket POS printer on the market to be Apple AirPrint certified.AirPrint provides easy mobile printing solutions for Apple iPad, iPhone, iPod and MacBook users on any private network with the key objective to be able to wirelessly print via the customer’s network without installing specific printer drivers. With AirPrint support pre-installed on iOS devices, the user is able to connect to and print from the required printer. Traditionally, AirPrint has been purely the domain of wider output inkjet and laser printers for business and personal use, but Apple has now confirmed its rightful place in the POS retail and hospitality sectors with its certification of the first AirPrint receipt and ticket printer from Star. Star’s TSP654II perfectly meets the requirements of the first Apple AirPrint printer given its 300mm/second print speed, high quality 203 dpi print output, compact footprint and aesthetic design. Furthermore, the printer can be used in vertical or horizontal mode and includes a wall mount bracket in the box as standard. Available in charcoal black or ultra white casing, the printer matches the Star CB2002 cash drawer options while easy paper loading and the splash proof cover option further enhance the features of the TSP654II AirPrint. Star is widely acknowledged as the leading hardware innovator in the move from more expensive traditional POS terminals to Cloud connected TabletPOS featuring lower cost hardware that can be mobile or fixed and easily upgradable as the business grows. Coupled with Cloud connected software that is flexible, low cost and progressively scalable according to market developments and individual business needs, TabletPOS is being increasingly chosen over traditional POS across retail and hospitality.